Fire which burnt 9 houses and 11 rent houses on Jl. Teratai, Kampung Baru, RT 09/11, Kembangan Utara, Kembangan, West Jakarta has been extinguished.
" 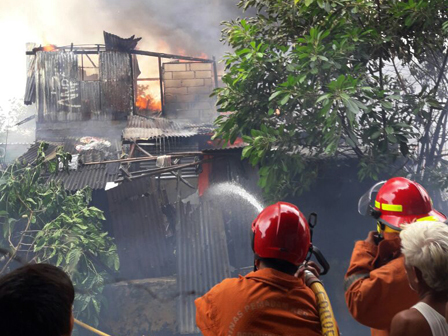 We are still investigating the cause and estimating the loss"
West Jakarta Fire Handling and Rescue Sub-dept. personnel on guard, Heru Mawardi said, his side received fire report at 11.30 A.M. and fire has successfully been extinguished in about 2 hours with 19 fire trucks. "19 fire trucks were deployed and fire was successfully extinguished at 1.30 P.M.," he said, Sunday (9/7). He informed there are no victims in that incident. The cause and loss of fire incident are still unknown. "We are still investigating the cause and estimating the loss," he closed.